New research investigates how bees shape and maintain their temporary travel-homes. 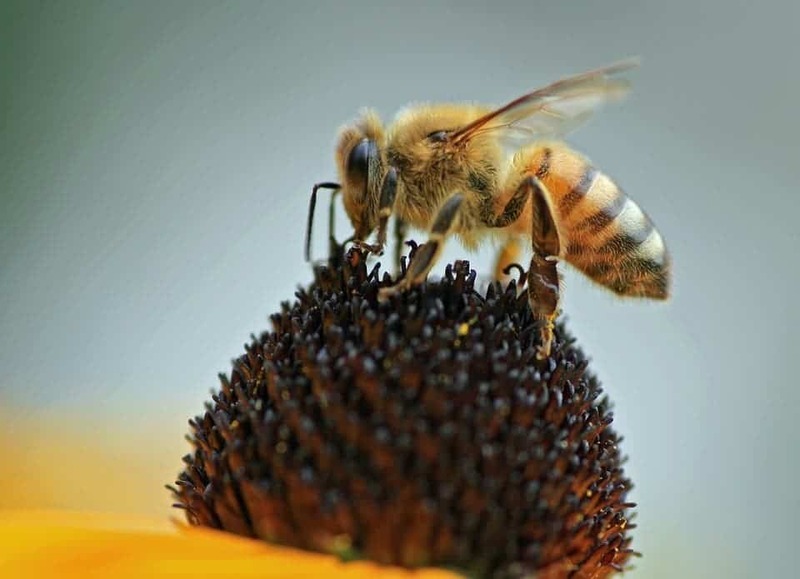 Researchers from the Harvard University (HU) report that honeybees make a group effort to keep the colony safe during their travels. The study looked into the mechanisms by which the insects keep their temporary clumps intact during adverse weather conditions — and found a surprisingly complex system born from relatively simple beings. Once every year, honeybee (Apis mellifera) queens leave the nest, with their subjects in tow, to establish new colonies. That’s faster said than done, however, and while the bees search for a new place of residence, they have to camp underneath the stars. In order to keep everybody safe during these times, the bees draw together into masses usually referred to as clumps or clusters. These structures — constructed entirely out of living, buzzing bees clinging together — generally form into a cone-shape. When the weather takes a turn for the worse, however, these cones tend to change shape, previous research has shown. Most intriguingly, they seem to adapt their shape to the particular conditions they’re faced with — even if the bees, individually, have no way of knowing what shape would work best. Curious to see how the bees knew what they had to do as conditions worsened, the HU team gathered wild bees and placed them in a container in the lab. Here, the bees were allowed to form a cluster from a movable apparatus that the team supplied for them. After the cluster formed, the team moved their apparatus back and forth or up and down to pull on the cluster. These motions were intended to simulate the effect of wind pushing on the cluster’s support — for example a branch. The team’s cluster dutifully changed shape — in the case of back-and-forth movement, it flattened, slowly ‘hugging’ the device. a) Bee clusters on a tree branch. b) The experimental set-up. c) The top panel shows the acceleration of the board versus time. The middle and bottom panels show how the bee cluster adapts its shape. Image credits O. Peleg, J. M. Peters, M. K. Salcedo & L. Mahadevan, 2018, Nature Phys. Such a shape is better suited to dealing with incoming wind, the team writes, just like a person lying on the ground versus somebody standing up in heavy winds. The honeybees’ activity was recorded with slow-motion video cameras so that the team could track their movement on the cluster’s surface. By watching the insects’ movements, the team also came up with a hypothesis — the bees, after feeling themselves pulled from the ones they were holding on to, moved to a place of higher stress. In order to test this idea, the group created a computer simulation of the honeybees and the cluster they form. Simulated bees on the outer surface were given the ability to feel stress and react to it by moving to a position of higher stress. In the end, the team writes, the virtual bees changed their cluster in the same way as real honeybees were observed to do in the lab — very strong evidence that the team’s theory was correct. The simulations also helped explain why up and down movements didn’t elicit a shape-change from the cluster; these movements, the team reports, do “not lead to significant differential strains and thus no shape adaptation” — i.e. they don’t bother the colony enough to require a response. “Together, our findings highlight how a super-organismal structure responds to dynamic loading by actively changing its morphology to improve the collective stability of the cluster at the expense of increasing the average mechanical burden of an individual,” the paper concludes. 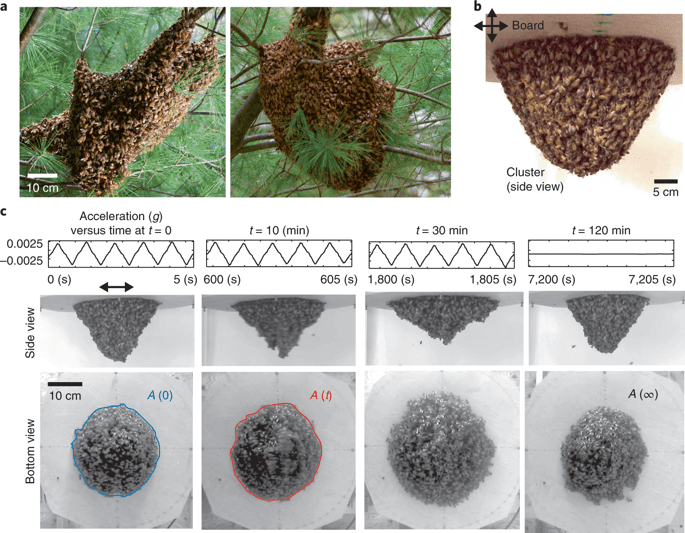 The paper “Collective mechanical adaptation of honeybee swarms” has been published in the journal Nature Physics.